During the last 12 years we sold 1.615 mosaics that have been produced in Syria. No design element gives a cultivated home more individuality and class than a real marble mosaic. The centuries-old traditions of the ancient cultures of Arabia, Greece and Italy are reflected in the noble marble and its natural colours. Hand-made mosaic images and marble borders demonstrate the power of authenticity. They are genuine and special – unmistakeably unique pieces. The artistic mosaic, made according to a free design, is pleasantly superior to the arbitrariness of modern mass production: as a wall mosaic or a floor covering, in the living room or in the kitchen, and particularly in the bathroom. The mosaic harmonises wonderfully with tiles, stone objects, ceramic, and even with further marble elements. A mosaic transforms the bathroom into an oasis of wellbeing and gives the room its very own character, reminiscent of the bathing rituals of antiquity. With a natural stone mosaic of the trade mark IVENZO you have chosen the very highest degree of artistic quality and craftsmanship for yourself. For there is a very special concept behind the mosaic art of IVENZO: we combine the original richness of Arabian craftsmanship with German thoroughness of quality and organisation. Save yourself unnecessary disappointment and trust our quality guarantee, which complies with German law. For the installation, the mosaic stones are first mounted on a net. This means that laying the mosaic is cheap and simple. Whoever can lay tiles can also install our mosaics. 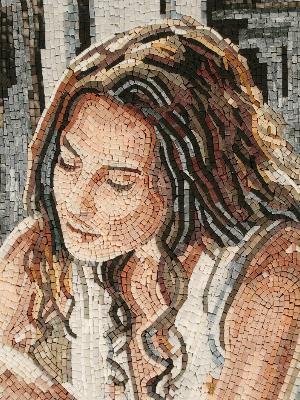 Design your own mosaic work of art and make both a surprising and stylish impression on your own home. On our website you will find hundreds of Greek, Roman and modern mosaic motifs that will inspire you. You can get comprehensive information about marble as a material and the colours that are used, and learn how the mosaic can be made according to your own personal taste with smoothed, pounded and polished surfaces. Naturally we have also compiled references from satisfied customers for you and answer the most frequently asked questions about hand-made marble mosaic. A good mosaic requires patience. We give it this time. Why not do the same: allow your design to mature and treat yourself to the sensual experience of the creative act. We will happily support you with our experience and expertise. The mosaics shown here are in stock and available for immediate delivery. The production of bespoke mosaics in accordance with special customer requirements can involve a delivery time of up to 2 months. We kindly request you to take this delivery time into account when you order your bespoke mosaics. Please click on an image to get the the details of a mosaic.